When the engagement of Prince Harry and Meghan Markle was announced and that the wedding would take place at St. George’s Chapel, Windsor Castle on 19th May 2018, it immediately created worldwide interest. website www.royal.uk and her details can be found under, About the Duchess of Sussex. Meghan is the first American officially to marry a member of the British Royal Family. King Edward VIII married American divorcee, Wallis Simpson in 1937, but only after Edward had abdicated. The couple married at a castle outside the city of Tours, France, in June 1937, with fewer than twenty guests in attendance. The wedding of Prince Harry and Meghan Markle has been acclaimed as the best royal wedding ever. Six hundred world famous guests attended the ceremony. As well as members of the Royal Family, celebrities included, Amal and George Clooney, Sir Elton John, Oprah Winfrey, Serena Williams and David and Victoria Beckham. Harry and Meghan invited 2,640 members of the public into the grounds of Windsor Castle. The congregation were enthralled by Bishop Michael Curry, the head of the American Episcopal Church who gave a passionate and lengthy sermon about the power of love. The music included the song, “Stand By Me”, sung by a gospel choir, The Kingdom Choir. Harry and Meghan, the newly announced Duke and Duchess of Sussex, left the Castle after their marriage in an open Ascot Landau carriage drawn by the famous Windsor Grey horses. 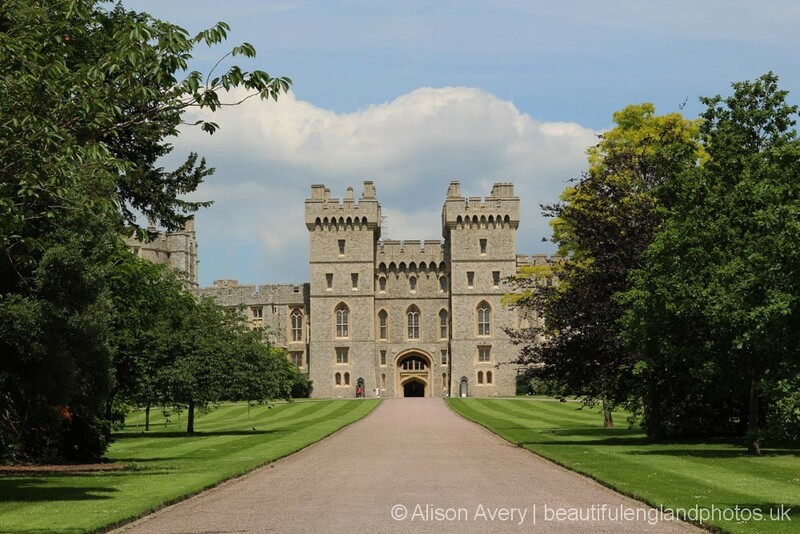 They drove through the streets of Windsor and down The Long Walk, which was filled to capacity by cheering crowds of well-wishers and then back to the castle. Over 100,000 people filled the streets of Windsor and The Long Walk for the special occasion. The worldwide TV audience peaked at 300 million with 18 million viewers in the United Kingdom. Where is Windsor Castle, Berkshire? Windsor Castle is situated in Berkshire – about 20 miles west of London. The county is one of the oldest in England, being created by Alfred the Great of Wessex. It is also proudly known officially as the Royal County of Berkshire, the title being bestowed upon it by Her Majesty Queen Elizabeth II, as her personal residence is at Windsor Castle. The Royal Standard flies from the Round Tower at the Castle when the Queen is in residence. Berkshire is one of the Home Counties west of London, the history of which has been strongly influenced by its strategic position and the River Thames which flows through it. The quiet scenes of English country life, the inspiration of so many artists and writers, still remain a reality. The Thames is a valuable leisure facility and traditional boating trips are enjoyed from numerous tranquil riverside villages. The town of Eton and the famous public school, Eton College, is across a footbridge on the opposite bank of the River Thames from Windsor. The Berkshire Downs connect the Chiltern Hills in the east with the Marlborough Downs in the west. The Downs are a hilly area with well wooded valleys and especially open upland areas, famous for their ever present racehorse training gallops. Lambourn and the thatched villages of East Garston and Eastbury are famous for their horse-racing stables. There are racecourses at Ascot, Newbury and Windsor. Windsor Castle is the oldest of all the English Royal homes and the largest inhabited castle in the world, covering thirteen acres. William the Conqueror built a castle here 1,000 years ago and almost all succeeding monarchs have made alterations to the building, giving the castle the unforgettable skyline we see today. Many sovereigns and famous people are buried in St. George’s Chapel, including Charles I, Henry VIII and Jane Seymour. I have posted my photos of Windsor Castle and Town here. I was also lucky enough to see the Queen Mother at Windsor in 1997. 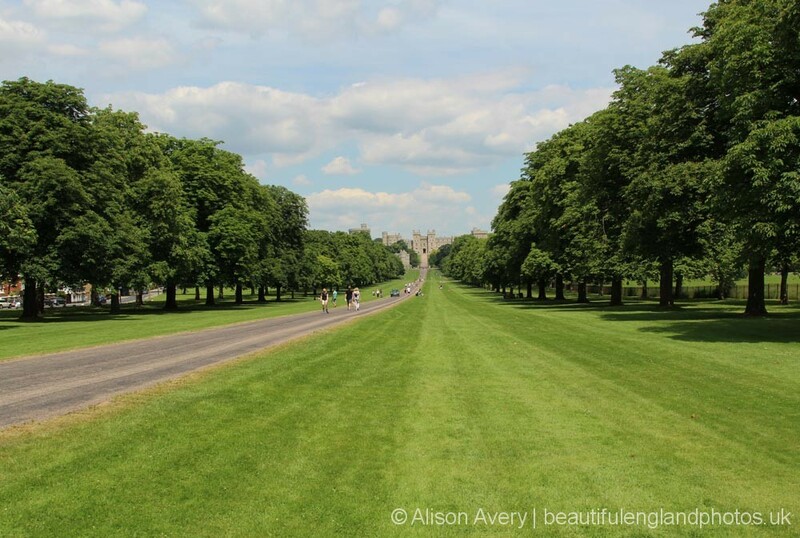 Windsor Castle is also the location of the famous ‘Long Walk’. 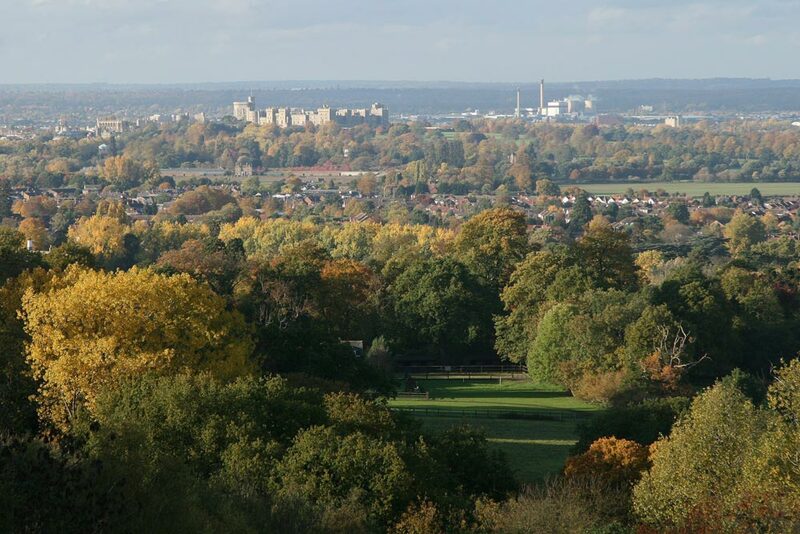 It is almost three miles long and connects Windsor Castle with the four thousand eight hundred acres of Windsor Great Park. It provides a magnificent tree-lined approach and remarkable panorama of the entire length of the Castle. At the far end of this straight walk, is the Copper Horse, a statue of King George III on his horse, erected on Snow Hill in 1831. St. George’s Chapel is a 15th Century gothic chapel, set in the grounds of Windsor Castle. It is one of the finest examples of Gothic architecture in England. It usually holds about 800 guests – much smaller than Westminster Abbey – the location for William and Kate’s wedding, which holds 2,000. The chapel is very familiar to Harry, the youngest son of Princess Diana, who was christened here in 1984. It was also the location for Prince Charles, Harry’s father and Camilla’s televised religious blessing, following their civil ceremony in 2005. More recently, Harry’s cousin, Peter Phillips, married the Canadian, Autumn Kelly, here in 2008. It was reported that Harry and Meghan love the building and its surrounds, following secret visits to Windsor.